Difference between revisions of "Gene Mendez"
[[File:Seitz_and_Mendez.jpeg|thumb|right|400px|Mendez & Seitz (1961)]]Alzana soon returned to ''The Greatest Show On Earth'', but Gene Mendez was now in high demand (with or without Joe Seitz), and it was not long before offers began to come from major European circuses. In 1959, Gene played himself in Joseph Newman’s film, ''The Big Circus'', which was shot at [[Clyde Beatty-Cole Bros. Circus]], where Mendez & Seitz were under contract, and which with they toured until the end of the 1960 season. [[File:Seitz_and_Mendez.jpeg|thumb|right|400px|Mendez & Seitz (1961)]]Alzana soon returned to ''The Greatest Show On Earth'', but Gene Mendez was now in high demand (with or without Joe Seitz), and it was not long before offers began to come from major European circuses. In 1959, Gene played himself in Joseph Newman’s film, ''The Big Circus'', which was shot at [[Clyde Beatty-Cole Bros. Circus]], where Mendez & Seitz were under contract, and with which they toured until the end of the 1960 season. Gene Mendez (1937-1993) is a legendary figure among high wireA tight, heavy metallic cable placed high above the ground, on which wire walkers do crossings and various acrobatic exercises. Not to be confused with a tight wire. artists, a talented and fearless performer who helped popularize the style of the solo “daredevil” high-wire artist—as opposed to the often slow-moving high wireA tight, heavy metallic cable placed high above the ground, on which wire walkers do crossings and various acrobatic exercises. Not to be confused with a tight wire. troupes that were the norm until the early 1970s. Energetic, nimble, with a wonderful “Latino” temperament, he worked without a balancing pole and without a net, in the manner of low wireA tight, light metallic cable, placed between two platforms not very far from the ground, on which a wire dancer perform dance steps, and acrobatic exercises such as somersaults. (Also: Tight Wire) artists such as Con Colleano. He was born Giner E. Mendez in 1937 in Moca, in the U.S. Territory of Puerto Rico. His family moved to Brooklyn, New York, when Gene was still a child. He wanted to be a circus artist; it was not just a vague childhood dream: As a teenager, he began to train seriously in gymnastics (notably on the horizontal bars) and did some bodybuilding. In 1951, after seeing Harold Alzana in the Ringling Bros. and Barnum & Baily show at Madison Square Garden in New York, Gene began self-training in wire walking… in his mother’s apartment! He quickly developed a talent for the craft, and eventually participated in a televised talent show in Philadelphia, where Karl Wallenda noticed him. The famous high wireA tight, heavy metallic cable placed high above the ground, on which wire walkers do crossings and various acrobatic exercises. Not to be confused with a tight wire. artist contacted Gene and offered him to become a member of his troupe. Mendez trained with the Master, who had a special method for teaching confidence on the wire (which was close to the ground during rehearsals): He shook it violently to test his students’ balance. One day, the exercise led Gene to lose his balance pole and violently sway the cable as he fought to stay on it; Karl Wallenda had to jump down, but Gene quickly resumed his composure and remained on the wire, walking without his balance pole "à la Alzana." In fact, he always found it difficult to keep the pole in balance—even though the pole was meant to help him keep his balance! 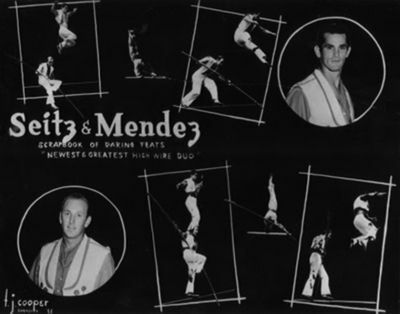 Gene Mendez worked for some time with the Wallendas, and indeed learned a lot from the legendary Karl, but his model remained the likes of Harold Alzana and, in the late fifties, Mendez left Wallenda to create an act of his own with fellow members of the Wallenda troupe, Josef (Joe) Seitz, and Leon Fort. The trio was quite successful, Mendez doing his best to emulate the solos of Alzana. As a matter of fact, Mendez didn’t need two partners: Fort quickly left, and the trio became a duo, billed as Mendez & Seitz. Gene Mendez’s breakthrough came on April 4, 1958, when Harold Alzana, the artist Mendez had emulated, and a major star of the Ringling Bros. and Barnum & Bailey Circus, was victim of a fall during the opening performance at Madison Square Garden in New York. Mendez and his partner, who were doing scattered dates around the country, were immediately contacted, and Gene Mendez took Alzana’s spot. Although it was only momentary (Mendez & Seitz had prior commitments), it was indeed a great exposure, which was duly noticed by the press and the circus community—and by Ed Sullivan who invited Mendez to his television show in June 1958. Alzana soon returned to The Greatest Show On Earth, but Gene Mendez was now in high demand (with or without Joe Seitz), and it was not long before offers began to come from major European circuses. In 1959, Gene played himself in Joseph Newman’s film, The Big Circus, which was shot at Clyde Beatty-Cole Bros. Circus, where Mendez & Seitz were under contract, and with which they toured until the end of the 1960 season. Everywhere, their act was a sensation. They spent the winter of 1964-65 at the Kelvin Hall Circus in Glasgow, and in 1966-67, they were featured with one of Europe’s most prestigious shows, Bertram Mills Circus at Olympia in London, in what was sadly its farewell production. While Joe Seitz settled in Spain, and the duo worked mostly in Europe, Gene Mendez often returned to the United States and worked a solo act. In 1965, he appeared in ABC Television’s Hollywood Palace. In 1976, Gene Mendez had a cameo in Byron Russ Chudnow’s film The Amazing Dobermans (later known as Lucky), staring Fred Astaire and Barbara Eden. 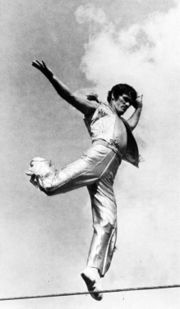 Two years after his only fall, in 1977 in San Antonio, Texas, in which broke a wrist and elbow, Gene Mendez joined the cast of Irvin Feld’s Cirque de Monte Carlo Spectacular, a one-ring show that toured the United States in 1979 with Elvin Bale, a good contingent of Hungarian acts that had been awarded at the International Circus Festival of Monte Carlo, and the Festival’s iconic French ringmaster(American, English) The name given today to the old position of Equestrian Director, and by extension, to the presenter of the show., Sergio. Although the show was successful, it didn’t last more than its initial run, due to disagreements between Feld and Prince Rainier of Monaco. In the late 1970s, Gene Mendez teamed up with his wife, Eleanor (née Demetrios, b. 1947), who took the role that had been that of Joe Seitz—although in a more spectacular way since she acted as the under-standerIn an acrobatic act, the person who is at the base, supporting other acrobats (for example, the base of a human pyramid). Also known as the "bottom Man" (or "Bottom Woman"). in the two-person-high column on the cable, with Gene on her shoulders. They were featured in 1981 in a 3D Disney circus movie to be shown at DisneyWorld in Florida. Together they would also go and tour the Far East with the British Chipperfield Circus in 1988, but they worked mostly in the United States. Gene also took on doing stunt work, notably for the film Big Top Pee-Wee, with the comedian Paul Reubens (aka Pee-Wee Herman) in 1988. Yet, Gene’s age was slowly catching up with him, and his health was not as good as it seemed—especially for the line of work he had chosen. He and Eleanor had settled in Clermont, Florida, near Orlando. On August 11, 1993, Gene Mendez died of a heart attack in his home. Unlike many circus artists', his death didn’t go unnoticed; Gene Mendez was still a major circus personality, and his passing—which was indeed quite untimely—was reported by major newspapers around the country, and even abroad. Gene Mendez had been one of the greatest high wireA tight, heavy metallic cable placed high above the ground, on which wire walkers do crossings and various acrobatic exercises. Not to be confused with a tight wire. acrobats of the 20th century, and had inspired a new generation of wire walkers such as the Carillo Brothers and many others.